Foote died in 1974 after a career as a diplomat. During World War II, he was involved with U.S. lend-lease operations supplying the Soviets. A grandson dismissed Bird's claim Friday. In a telephone interview, Bird said more research would be required to prove that Foote was Ales but that "he fits the itinerary in every way, and Hiss simply does not." Foote's grandson said in an e-mail to The Associated Press signed Wilder Foote 5 that his grandfather "was cleared of any suspicion" of wrongdoing by the FBI and the McCarthy Commission investigating spy activities. "He was and still is innocent." "I can only assume that Mr. Bird has ulterior motives to besmirch my grandfather's name, possibly for Mr. Bird's own celebrity," Foote said. Also Thursday, Timothy Hobson, Hiss' stepson, said Whittaker Chambers, whose bombshell allegations against Hiss broke the case open, had lied about his personal relationship with Hiss and had never visited the Hiss home as he claimed. Hobson, 80, said that during the time Chambers claimed to have visited the home, he was recuperating from a broken leg and met every person who came calling. Chambers was a former American communist party member who spied for the Soviets during the 1930s. He defected before World War II and accused others of being spies, but his claims did not attract FBI interest until after the war. He joined Time magazine in 1939 and as a writer and editor was a severe critic of communism. He died in 1961. 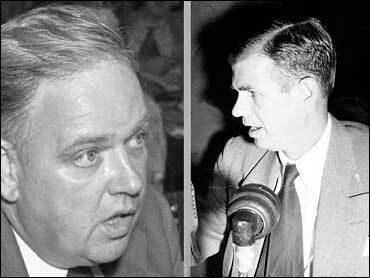 "It is my conviction that he was in love with Alger Hiss, that he was rejected by Alger Hiss and he took that rejection in a vindictive way," Hobson said.